Bentra Golf Course is located in the County Antrim town of Whitehead in Northern Ireland. It is a matured 9 hole course and is designed with the experienced golfer and novice in mind. Bentra is also home to our Mini Golf course. The mini golf course, features 18 holes highlighting key points of interest from the Borough throughout, players must plot their way round the fun and exciting challenges of each hole. Wide fairways with some long holes ensure a steady round. The clubhouse has changing rooms and golf shop with club and trolley hire available. A bar and restaurant overlooking Larne Lough is on hand to allow you to relax after a round. Bentra offers an attractive and inexpensive days golf. Societies are welcome but please contact the club house in advance. 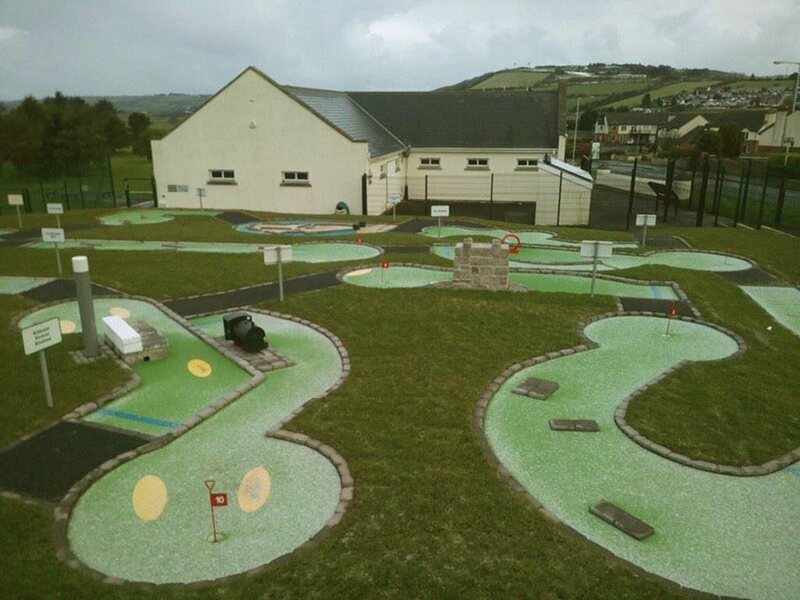 The mini golf course, features 18 holes highlighting key points of interest from the Borough throughout, players must plot their way round the fun and exciting challenges of each hole. Mini Golf Fees: 13 or older (£3.50), 5 – 12’s (£2.00), Under 5’s (£1.00), Family Ticket (£10.00). 25% discounted rate for 10+ players. Golf course members receive free entry to the mini golf facility. The Mini Golf Tees Names are: 1.Blackhead Path; 2.Carrickfergus Castle; 3.Portmuck; 4.Blackhead; Lighthouse; 5.The Blaa Hole; 6.The Gobbins; 7.The Rinkha; 8.The Blackhead WWII Radio Station; 9.Chichester Castle; 10.The Railway; 11.Kilroot Power Station; 12.The Aerodrome; 13.White Harbour; 14.The Goshawk; 15.The Town With No Streets; 16.Knockagh Monument; 17.Diamond Jubilee Wood; 18.Muldersleigh Hill. The mini golf facility was officially opened on Friday 30th January 2015.